eligible qualifications having persons may apply online for you desired post in Ballari BDCC Bank on or before 04-12-2017. Online application form @ http://recruit-app.com/bdcc_2017/ will be available from 08-11-2017 for this Ballari BDCC Bank Recruitment Exam 2017. There are total 62 vacancies in this Ballari BDCC Bank Recruitment 2017 Notification. Selection for this Ballari BDCC Bank Second Division Assistant, Attender jobs is through Written Test, Interview and certificates verification. Online applications for this BDCC Bank Jobs will be accepted through Ballari BDCC Bank official website of www.Ballaridccbank.com. 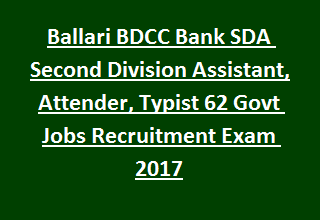 More details of Ballari District BDCC Bank SDA, Attender vacancies Recruitment 2017 Notification exam pattern, admit card dates, exam dates, final merit list, exam syllabus, number of vacancies and other information is given below. There are total 62 vacancies in this Ballari BDCC Bank Recruitment 2017. Age limits as on 04-12-2017 for Attender, SDA and Typist jobs 18-35 years. For reserved candidates of Ballari District Cat 2a, 2b, 3a, 3b upper age limit is 38 years. For SC and Cat 1 candidates upper age limit is 40 years. Post wise qualifications details of Ballari BDCC Bank vacancies are given below. For all the posts candidates must have known Kannada languge. For SDA Jobs-Second PUCC with 50% of marks and computer knowledge. For Typist Jobs-Second PUCC with and should have passed Senior Grade Type writing exam in Kannada and English Language along with Computer knowledge. For all other categories Application fee is Rs.300+ Rs.30 charges. Submit your application form before the closing date itself. Last date for submission of application form online is 04-12-2017. Application form will be accepted through Ballari District Central Cooperative Bank Official website or www.Ballaridccbank.com.